More farmers are buying dairy technology that gives them a fast payback, says Waikato Milking Systems. Farmer Smarter - What New Zealand Technology offers UK Dairy Farmers. Click the Link below to view the article published in the British Dairying Magazine. New Zealand expertise in the design and manufacture of dairy goat rotary platforms is in demand in China. 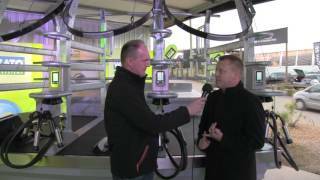 Evolutionary automated drafting system unveiled at Fieldays 2017. The Schuler Brothers Ltd (SBL) dairy goat farm in Te Aroha has a unique milking shed. Waikato Milking Systems is buying one of New Zealand's leading dairy effluent management solutions companies, Hi-Tech Enviro Solutions. Waikato Milking Systems has taken out the Fieldays' International Innovation Award with its Centrus 84 rotary platform. Northgate Business Park's solitary building will soon have a neighbour. Waikato Milking Systems advertisement in the Autumn 2014 of NZ Dairy online publication. Sansaw Estates chose a rotary and integrated technology from Waikato Milking Systems. Click to view the article - "Smart milking gear clears path ahead"
Click the source to view the article.